We've just reached our 12th Birthday, and as is tradition we're going to be celebrating this milestone with our annual Halloween Birthday Bash! As always, we'll be running a variety of contests and activities for everyone to participate in throughout this event, focusing on Halloween and video-games! Taking part in the festivities will earn you points that can be cashed in at the end of the event to get yourself some hot prizes, so even if you're not great at winning you still have a chance to get something! You're also welcome to make and/or suggest your own Halloween themed contests and/or activities, which will also be eligible for earning points. 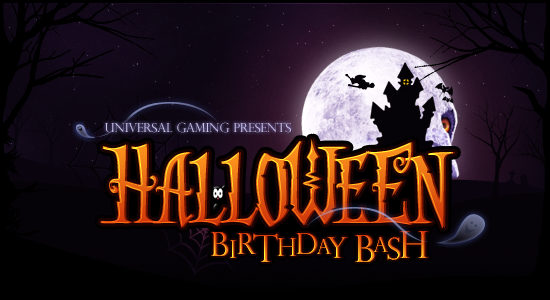 All of our Halloween Birthday Bash 2018 activities will be hosted in the Contests & Events forum. You must have at least 50 posts to receive a cash prize. Spamming to hit this requirement will result in disqualification and forfeit of receiving any prizes. Any evident signs of cheating or manipulation by any user during this event may result in immediate disqualification and forfeit of any prize you may have been eligible for. Staff may compete and earn points, but might not be eligible for cash prizes or items from the prize pool. Hi everyone! I know it's a little late, but the results are finally here for our Halloween Birthday Bash event! Oh man, I won again. I only say that as I don't aim to win. I will make use of the signature at least. Coloured Username I'm not bothered with, nor a prize or cash. Already treated myself to a £15 Nintendo Gift Card so in a way that can be it. EL you forgot to use this! It is important for this occasion! Wow, can't believe I got third. xD I was just aiming to play for a bit really. xp Hmm.. I'll take a $10 eshop card, & the color I want this time around is: #b8860b dark goldenrod. Oh hey, 2nd place again for the 2nd time. I guess redeem my points for two more cards, and let me know if you need my info again. ...the color I want this time around is: #b8860b dark goldenrod. Your username colour will expire on December 22nd. You have received the following cards: Grand Theft Auto, Horizon Zero Dawn. Completely forgot to redeem my points, so I'd like 4 UG Cards from the 12 of my 14, please. User receives the following cards: Ratchet & Clank, Grand Theft Auto, Persona, and Spyro The Dragon.